Seeing more & more Michael Tuttle guitars listed around these days. Tuttle's builder resume includes stints with Valley Arts and Don Grosh before starting his own name brand. Michael has a reputation for fine fretwork-- and winds his own pickups as well. 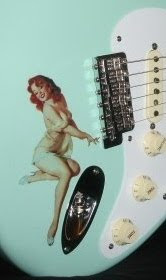 Our featured Standard Classic S is currently listed by Virginia based dealer Rocket Music as new. The "thin" cream poly finish covers an alder body loaded with Tuttles own 60's S single coils and a vintage 6 screw trem. An .830 "C" neck with 12' radius sports 6150 frets. Tuttle guitars are priced in friendly craft territory, well under Masterbuild markups, and endorsed by working, session guys like Jeff McErlain (Check the video tab at Tuttle site). Plenty of bang for your boutique buck!! !